This third part shows the other side of the coin. After explaining the factors that regulate endothelial and coronary microvascular function (part A and B), we describe different methods and aspects that can be integrated with conventional medicine with considerable impact in terms of therapeutic effectiveness and of health care costs. We talk about nutrition and herbal medicine, exercise, mind-body disciplines, attention to emotions and to the psycho-social background of patients. And this is the answer to the crisis of the Western therapeutic model suggested by a relatively new current of thought in medicine: the Integrative Medicine. What can be concretely done to modulate endothelial function in a healthy way? The search for circuits, diagrams of relationships between organs and cells, the drawing of functional maps in the human body that are detached from the fixity of the organ anatomy, lead the recognition of the importance of continuous cross-talk between cells, organs and systems in both physiological and pathological conditions, based on the fine regulation of the levels of a large number of interconnected messenger molecules. Thus, it is possible to interpret the pathological phenomenon as an alteration in the communication between the cells, an imbalance in intercellular signalling . These alterations of signals and dialogues, determine, over time, new balances and compensations within the PNEI network, with the possible final appearance of symptoms and the state we call “disease”. Each symptom is, after all, a message in PNEI terms. Nowadays is possible and we should understand the different messages to provide care. We must continue our researches free, in order to learn how to read these messages properly, resisting, sometimes, the temptation to write before knowing how to read. From what is described up to now, it appears clear that the endothelial function can be understood as an epiphenomenon of a cellular stress condition, more than a primitive pathological condition. The regulation of coronary flow reserve and endothelial function in general, clearly shows the importance of PNEI factors in physiological but also pathological conditions and suggests the need to explore new therapeutic horizons . The key to preventing and treating many disease processes relates to the modulation of allostatic load of each individual. This strategy relates to the ordinary life of each person and is independent of any form of drug therapy. It is important to underline the concept of stress management and not stress elimination. Obviously, the stress response is important in an acute objective danger scenario. Furthermore, a bit of chronic stress is healthy (for example, a positive stimulating stress or a moderate physical activity lead to the release of IGF-1, TNFα, IL-4, IFNγ and the production of Brain Derived Natriuretic Factor (BDNF), promoting neurogenesis and mnemonic capacities ). Results from recent researches indicate that the active ingredients of foodstuffs and herbs affect the expression of genes related with neurotransmitters, hormones and cytokines in the PNEI network [4,5]. Therefore, PNEI interaction network and its modulation by aliments and plants open out new mechanisms to understand clinical results on health achieved by nutrition and herbal medicine and enriches current research on complex diseases as well as systems biology. Epidemiological and clinical studies have demonstrated that natural products, in daily diet or phytomedical preparations, may improve vascular function by enhancing NO production and bioavailability . Phyto-ingredients in tea, cocoa, pomegranate and soy are known to positively influence eNOS activity and/or endothelial function, in vitro and in vivo and could be considered as valuable and low-cost tools for the prevention or treatment of cardiovascular diseases . Foods that we introduce in the diet are not only a source of calories but are important modulators of the nervous system [8-12], the endocrine [13-16] and immune systems [17,18]. Some diets heighten the inflammatory state, promoting development of diseases, through perturbations of host-microbe interactions [19-21]. Berer et al. demonstrated that the commensal gut flora-in the absence of pathogenic agents-is essential in triggering immune processes, leading to a relapsing-remitting autoimmune diseases [22-25]. Thus, a proper diet (such as Mediterranean diet [26-29] and Vegan [30,31] or Vegetarian diets [32-38]), acting on the different axes of the PNEI network, have positive effects in terms of treatment and prevention of various diseases , including cardiovascular ones [40-42]. In particular, it has been shown that an intensive nutrition education intervention, brings in 6-12 months to a lasting change in the eating habits of the patients, being able to get good benefits in terms of cardiovascular prevention (improved glycemic control, dyslipidemia, obesity and reduction of major cardiovascular events, such as myocardial infarction and stroke) [43-45]. Finally, a recent meta-analysis by Schwingshackl et al. showed that the Mediterranean diet is accompanied by a decrease of inflammation parameters with an improvement in endothelial function. Similar results seem to be achieved also with the use of certain plants used in traditional Chinese  or Ayrvedic medicine . The example of the diet can also be applied to the world of herbal medicine. The purpose of this work is not to explain the complex therapeutic effect of individual herbal compound(for this purpose please consult Firenzuoli et al. , or any herbal medicine book). We only limit ourselves to provide a list of the main herbs that currently find a concrete clinical application in CVD prevention and treatment, regulating endothelial function: dark chocolate, coffee, cocoa, green and black tea, Vitis Vinifera, Salvia miltiorrhiza, Ginkgo Biloba, blueberry (Vaccinium myrtillus) and cranberries, Garlic (Allium sativum), nutmeg oil, curcumin, soy beans, Paeonia lactiflora, Papaverine, Ginseng (Panax notoginseng), Hypericum, Vinca minor, Selenium, Ephedra, Licorice, Mistletoe (Vischium album), Hawthorn (Crataegus monogyna or Crataegus oxycantha), olive leaves (Olea europea), Ligustium wallichii, Jatropha podagrica, Stephania tetrahedron, Salvia miltiorrhiza, Uncaria rhyncophylla, Artemisia capillaris, Peucedanium praeruptorin, the family of the Gentianaceae, Paeonia suffruticosa, Equisetum arvense, hawkweed (Hieracium pilosella), couch grass (Triticum repens) and ribes nigrum, birch (Betulla alba), Orthosiphon, Guarana, Rutaceae family (Citrus, Barosma betulina, Ruta graveolens), Horse chestnut (Aesculus hippocastanum), Cypress (Cupressus sempervirens) and Amamelide (Hamamelis virgininana), Centella asiatica, Sweet Clover (Melilotus officinalis), Birch sap, Bermuda grass (Cynodon dactylon), the Dandelion (Taraxacum officinale) and the Artichoke (Cynara scolymus) or Hawkweed (Hieracium pilosella) . In future it will be important to study precisely the effects of herbs on the PNEI network; effects that will indirectly affect the cardiovascular system and its state of health . The aerobic exercise has been widely shown to be an important factor in cardiovascular prevention, being able to reduce oxidative stress and inflammatory parameters, to improve blood pressure, glyco-metabolic and insulin control and to optimize the sympathetic/parasympathetic balance acting on endothelial function in positive terms . Regular physical activity and normal weight are both important indicators for a decreased risk of mortality from all causes, cardiovascular diseases and cancer: in particular physical activity has a strong independent effect on mortality  according to the fitness level and physical activity patterns . Nowadays also neurologists and immunologists are studying the effects of physical exercise on the psychoneuroimmunologic network’s modulation [53-55]. Walsh et al. demonstrated that physical training can maintain immune health, especially with low to moderate load volumes and intensity programmes . In particular, it is important to employ a gradual and periodised increase in training volumes and loads, adding a variety to limit training monotony and stress, avoiding excessively heavy training loads that could lead to exhaustion, illness or injury . The direct link between physical activity and immune activity has been demonstrated by some interesting works of Nieman et al. [57-64] . The Authors demonstrated that walking five days a week, 45 minutes at a time and for 15 weeks, halves sick days for respiratory infections and revealed that a moderate daily physical activity of 30-45 minutes, invigorates the immune system, while if it is prolonged to 90 -180 minutes, after initial stimulation, making the body more susceptible to infections . Chronic diseases such as cardiovascular disease, type 2 diabetes and cancer are associated with persisting low-grade systemic inflammation. It has been demonstrated that regular exercise induces anti-inflammatory effects with elevated levels of anti-inflammatory cytokines and suppression of TNFα production . Bergh et al. have recently shown that exercise, to be an effective advantage in terms of prevention and treatment of cardiovascular diseases, must be accompanied by a good psychological resistance ability to stress . In fact,low-stress resilience in adolescence is associated with increased risk of CVD in middle age. The association remains after adjustment for physical fitness: higher physical fitness is inversely associated with CVD risk; however, this is significantly attenuated by low-stress resilience . What is written in the DNA code could change its phenotypic expression in response to the environment [68,69,70], through PNEI network mediators. The cardiovascular balance is influenced by this network (stress response) , whose organization is then transmitted to the offspring through epigenetic signatures  explaining the familiarity of many cases of CVD or why migrants acquire the same CVD risk of the new region they are living in [73,74]. Thus, individual lifestyle and the surrounding environment are so important because can effectively modify the transgenerational inheritance of stress axis balance and/or its activation and function during our life (with all the consequences on our health) . The effects of physical exercise, diet and smoking cessation on CVD prevention and treatment are well known. However, tests have shown that myocardial ischemia can be elicited by mental stress in a laboratory and in everyday life and that ischemia induced by mental stress is associated with an increased risk for future cardiac events in patients with coronary artery disease (Figure 1 shows the survival curves according to coronary heart disease related to perceived stress impact). Behavioral and stress management interventions offer additional benefit over and above standard medical care in cardiac patients with evidence of myocardial ischemia , especially considering the lack of efficacy of standard beta-blocker therapy on low heart rate-related ischemia during mental stress , or the inability of the standard ergometric tests (exercise or pharmacological stress) to exclude the presence of inducible ischemia because not able to detect the form of myocardial ischemia induced by mental stress . Figure 1. 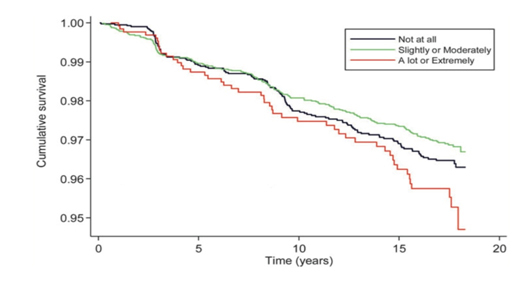 Kaplan-Meier survival curves showing the association between the perceived impact of stress and incident coronary heart disease adjusted for sociodemographics, health behaviors, biological cardiovascular disease risk factors, self-rated health, negative affect, psychological distress, social support and perceived levels of stress (Modified from ). Our inner dialogue modulates cardiovascular function: At the same event, people experience different emotional reactions and a same person during his/her life and maturation could react differently in similar, specific situations. Between event and emotion there is no automatic link. According to Rozanski et al. specific personalities and their characteristic psychological traits (depression, anxiety, character traits, social isolation, and chronic life stress) contribute significantly to the pathogenesis and expression of coronary artery disease (CAD) because of adverse health behaviors (such as poor diet and smoking) and direct biological mechanisms, such as immune, neuroendocrine and platelet activation . Thus, the concept of “personality”(namely “the individual differences in characteristic patterns of thinking, feeling and behaving” ) represents a key factor in regulating the health of the cardiovascular system. Emotions do not automatically take away from what happens in people's lives, but are derived from the type of internal dialogue that is done compared to what happens. Different personalities are more or less vulnerable to stress, with relationships exiting between different personalities and the function of the hypothalamic-pituitary-adrenal (HPA) axis [81-85] and immune [86,87] and nervous systems . Different patterns of thinking, feeling and behaving essentially modulate the cross-talk between the nervous, endocrine and immune systems. It is just as true that the nervous, endocrine, immune and metabolic systems and their function could influence mental attitude . In particular, “type D” personality or the “type A coronary-prone behavior”, according to Friedman and Rosenman-1974, are related to higher incidence of CVD [79,90]. Although with many nuances, it can be said that every human being can only try two great emotions in their lifetime: love (serenity, tranquillity) or fear. And never at the same time . It oscillates constantly between these two poles. An inner dialogue oriented to the past or the future that is full of anxiety, distrust, jealousy, envy, ambition, regret etc. produces fear, in its various emotional colors. An inner dialogue turned to the present, concrete, confident, proactive, compassionate, conscious etc., produces feelings of "love" , serenity and tranquillity . In general, as described by Stegagno et al. , right cerebral hemisphere activity is prevalent during emotion recognition or expression (in particular for negative emotions) and during “keeping away” reactions. The left hemisphere is dominant in positive affective states and when seeking reactions. According to the same author , different neuromediators act on neural systems and circuits and their action could determine specific emotional, psychological and physiologic states. In particular: glucocorticoids, norepinephrine, gamma-amino butyric acid (GABA) and glutamate are the main players in fear reactions. They act on the amygdala and hippocampus, triggering fear–related memory and behavioral planning deficits. Moreover, reduced serotonin levels are related to unpleasant emotional states and the cocktail of low serotonin levels and testosterone excess is related to anger, aggressiveness and territorial defense behavior. Dopamine is the mediator of positive attitude: dopaminergic circuits in the limbic system are activated in case of satisfaction and they are the action site of many drugs and addictive substances. Mind-body therapies (meditation, breathing and bioenergetics): Meditation, a complex process involving change in cognition, memory and social and emotional control, leads to improvement in various cardiovascular, neurological, autoimmune and renal pathologies. The effects of stress are evident in each of the recognized mechanisms leading to cardiac events, including the clustering of traditional risk factors, sudden death, myocardial ischemia, plaque rupture, thrombosis and myocardial infarction as well as wall motion abnormalities, alterations in cardiac regulation as indexed by changes in sympathetic nervous system activity and homeostasis, endothelial dysfunction and malignant arrhythmias . There is nonetheless overwhelming evidence both for the deleterious effects of stress on the heart and for the fact that vulnerability and resilience factors play a role in amplifying or dampening those effects. Numerous approaches are available for stress management that can decrease patient suffering and enhance their quality of life . In general, studies on a range of stress reduction techniques have demonstrated significant decrease in cardiac events in patients with myocardial ischemia, stroke, atherosclerosis, hypertension and heart failure. As we will see, the practice of meditation appears to be a fundamental method in stress management and CVD prevention. It has two advantages: it helps to purify the cognitive evaluation of all our experiences from a number of errors and distortions related to simple past conditioning; but at the same time facilitates the management of physical reactions to stress. It’s easily expected that the term "meditation" makes many people and scientists suspicious. Our western and classical medical cultures are full of prejudices and incorrect ideas about what meditation is and its real use. In the context of this review, we speak about "meditation" not aspiring to import a New Age lifestyle and impose it as a foreign body in the life of individuals; nor is equivalent to yearn civilizations and cultures distant in time and space. The term "meditation" is inflated and loaded with meanings and images, often incorrect. In this paper, "meditation" has a specific meaning: a mode of mental functioning based on the control of attention that has strong repercussions both in terms of cognitive and physiological standpoint. If we look to the East is not to emulate awkwardly folk aspects, but to learn with scientific respect their millennial experience and knowledge. Jon Kabat-Zinn, founder and director of the Stress Reduction Clinic at the University of Massachusetts, calls "meditation", "the practice of keeping alive the attention from moment to moment" . Wanting further clarity on the meaning of the term, that's what meditation is NOT : it is not a mystical practice, although it has historically developed in religious contexts, mainly in the East. We must not forget that Eastern doctrines are not only a series of rites and ceremonies seemingly esoteric, but also a sophisticated and millennial mental functioning study. It is not a form of passivity or contemplative life but, on the contrary, something you can apply to the action, so much so that it was used to optimize the efficiency of samurai soldiers or rock climbers’ performance (please see http://warriorsway.com/the-rock-warriors-way-mental-training-for-climbers-2/). Although, often, the "meditation" is seen as an escape from the world. It is not another term for "relaxation". Meditation causes a feeling of well being and relaxation. But this is not its primary purpose. As it involves accepting all the moods that we live, it can also mean living feelings of anxiety and discomfort in order to change them. Meditation does not focus on content, but on the understanding of the content. It is not simply a technique that aims to enhance the attention, though its practice is focused on the use of attention and might result in a significant attentive capacity development. It is not a cognitive rebuilding technique, although its practice often allows to rethink and reformulate the meaning of situations. It's not a problem-solving technique, although it often allows to find appropriate solutions to real problems. What then is meditation in its essence? What then remains of it, once purified of all mystical and religious aspects? It remains the fundamental teaching of not reacting to the contents of the mind as if they were reality . We tend to confuse our thoughts about reality with reality itself. To use the psychological language, we tend to confuse the cognitive world with the real world. No human being has a direct and objective perception of reality. We believe that thoughts arise in reaction to real events, but they are often linked to the latter only indirectly and in a distorted way. With the practice of meditation is possible to understand that thoughts are just thoughts, while the physical reaction is based on the belief that they are the reality with capital R. Meditating, we realize that thoughts come and go, and the problem is that often we react to them too early, emotionally and with behaviors or actions. Neutralizing the reaction, we distance ourselves from being drawn into the vortex of actions and reactions triggered mainly by "negative" thoughts. Behaviorally, when we feel bad, we tend to react distracting or looking for actions that goes to "cover" the discomfort: make a phone call, open the fridge and eat, read the paper, we immerse ourself in the social networks, turn on the television and we can go on until smoking and or alcoholism. We find hard to pay attention to what is not pleasant. We try to protect ourselves, and from moment to moment, we have to decide between the wonderful world inside our heads and the reality of the here and now, whatever it is. Cognitively negative thoughts, if not recognized consciously, trigger the production of automatic routines, judgments, emotions, physical reactions and moods that tend to feed thereself in a vicious cycle of judgment and compensation. Esch describes : “Meditation can be defined as willfully and purposefully regulating one’s own attention, either for the purpose of relaxation, exploring oneself or personal growth and trascedence. Mediation can operationally be divided into two categories. Either one is focusing attention on changing object such as physical sensations in the body scan, progressive muscle relaxation, autogenic training, or movements in yoga, thai chi, qigong, or mental content as in guided imagery, or mindfulness meditation proper. Or an unchanging or repetitive object is constantly held in focus, such as in mantra meditations like Transcendental Meditation ® (TM) or Benson meditation, breathing meditation like Zazen, ostinato drumming, rhythmic dancing, jogging/flow, etc. In practice both categories frequently overlap, and normally the ability to keep one’s attention focused on a steady object is the precondition for the capacity to constantly attend to moving objects. All techniques are usually conducted with an attitude of intentionally directed or focused concentration and attention, which is called “mindful awareness”. As a consequence, they have the potential to elicit the so-called “relaxation response”, whose property is responsible for some of the observed clinical, medical or therapeutic effects of meditation, particularly in stress-associated diseases, including cardiovascular, immune, proinflammatory or neuroendocrine diseases, including anxiety or depression” (Figure 2). Figure 2. Top. 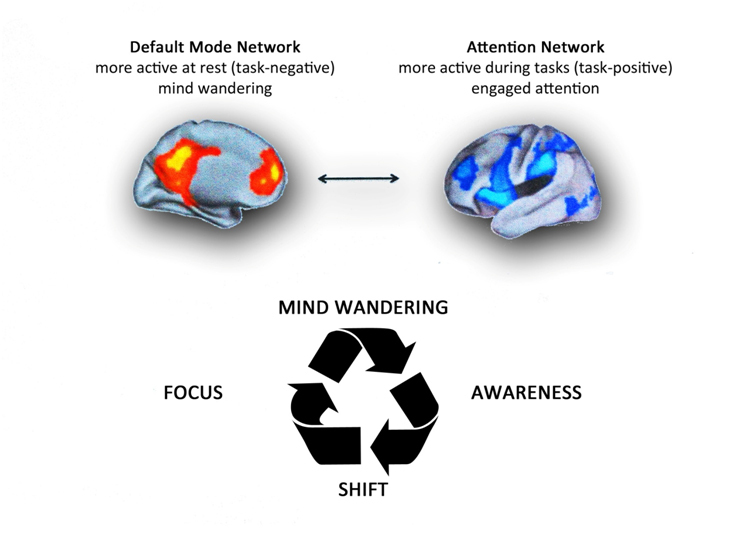 Brain networks associated with mind wandering and attention. The brain can be divided into two-large scale distributed network: the default mode network, in which is associated mind-wandering activity, and the attention network that is associated with focused states demanding attentional resourses. Down. The process of attention during meditation. A theoretical model of dynamic cognitive states experienced by a non-expert practioner during a session of meditation. When attempting to sustain focus (FOCUS) on an object (breathing, mantra, images, etc. ), an individual inevitably loses this focus and experiences wandering of attention (MIND WANDERING). At some time during mind wandering, the practitioner becomes aware that his/her mind is not on the object (AWARENESS), at which point he/she disengages from current train of thought and shifts attention back to the object (SHIFT), where it stays focused again for some period of time (FOCUS). Whith practice, the time spent during the focused and conscious thought increases. There are various methods of meditation with a common experiential goal. It 's like climbing a mountain: there are several trails, slopes, ascent velocities and path lengths, but the summit is the same. Modified from Schmidt et al. . The Transcendental Meditation® (TM) program has been found to decrease coronary heart disease risk factors (hypertension, diabetes, atherosclerosis,use of cigarettes and alcohol) and associated cardiovascular morbidity and mortality [98,92,99] leading to angina symptom improvements due to the reduction of anxiety and depression-related, chronic sympathetic activation . Furthermore, reduced health insurance claims were observed . Moreover, an American Heart Association scientific statement provided a class of recommendation of Class IIB, Level of Evidence B for TM implementation in clinical practice, based on the available level of evidence from published literature . The practice of meditation is accompanied by physiological peculiarities. We can observe a reduction in oxygen consumption, in the cardio-respiratory frequency of and blood pressure; the skin impedance increases and functional changes in brain activity happens (increasing in high-frequency, synchronized gamma waves in the electroencephalogram). It’s also possible to assess structural changes in the brain, with thickening of the areas delegated to the memory, attention, interoception, sensory processing as well as self-regulation and autoregulation [102,97]. Along with meditation practice, daytime secretion of pituitary hormones changes . Mediation is associated with dopamine production regulation, and brain’s motivation and reward systems activation ; meditation reduces cortisol levels , increases peripheral melatonin levels , determines norepinephrine and epinephrine reduction and rise in vagal tone , with obvious consequences on blood pressure, heart rhythm and anxiety lowering, and with improvement in the quality of life in patients with optimally treated heart failure . Serotonin and testosterone increase , and is possible to notice changes in growth hormone levels and thyroid stimulating hormone balance[109,110]. Acetylcholine and morphine levels augment in meditators increasing the activity of the constitutive nitric oxide-producing enzymes and determining and anti-inflammatory effect through NF-kB inhibition . In summary, mediation can counteract stress at the mental , physical, physiological and molecular level , restoring and harmonizing the brain circuits [113,114], modifying the activity of the DMN  (Figure 2), and the neuro-immune-[116-118] endocrine  secretion.This particular state of consciousness induce temporal DNA transcriptome changes in energy metabolism, insulin secretion and inflammatory pathways . This counteracts mononuclear cell activation due to psychosocial stress [121,122]. Meditation has proven to be a factor that can greatly increase the positive effects of dietary control and exercise on cardiovascular health, being able to determine an initial regression of atherosclerotic disease [123,124]. The practice of meditation is often associated with breath control and breathing patterns are important for cardiovascular health . Bernardi et al. studied this phenomenon showing how rhythmic formulas such as the rosary and yoga mantras can synchronize and reinforce inherent cardiovascular rhythms and modify baroreflex sensitivity improving prognosis in heart disease. Bernardi et al. demonstrated that recitation of yoga mantras and of the rosary (that was introduced in Europe after the Crusades, as a result of contact with Arabs who had been influenced by Tibetan and Indian traditions) slowed respiration to almost exactly 6/min, and enhanced heart rate variability and baroreflex sensitivity. They conclude that rosary recitation might be viewed as a religious practice as well as a health practice . Greater religious fervor is not necessarily accompanied by benefits in terms of CVD and health , probably because of a continual sense of guilt, mortification, self-judgment etc., that constantly activate the stress axis. Moreover, the amount of carbohydrates or proteins we eat could change our breathing pattern, as commonly demonstrated by respiratory ratio variation, which is easily assessed during a standard cardiopulmonary test . Some forms of meditation that aim to change individual inner dialogue, teaching emotional forgiveness to replace negative unforgiving emotions, show important health and well-being consequences  related to psychophysiological changes (anger or fear reaction control), and in DMN and stress axis balance. There is a postural coding for emotions with precise muscular patterns associated with specific emotions (the so-called “Body Action Coding System”) . Briefly,on the one hand, specific muscles are activated to express certain emotions, on the other, it was also found that the same muscles automatically responded to the perception of emotion, without any overt movement , and this could be part of a reflex starting from our mirror neurons . In this way, our feelings draw in the body a rest or “usual” body posture through the repetition of expressed or perceived emotions. Many Yoga [132,133-152], Thai Chi, Pilates or rock climbing practices act in this scenario, combining breathing exercises, meditation and movement, releasing muscular tensions within particular body areas, with benefits in physical and mental health [139,153-157]. At cardiovascular level, the practice of yoga has proven useful in the control of arrhythmias . As in the case of nutrition and exercise, the practice of meditation is accompanied with an improvement in endothelial function [142,159-163]. Recent studies revealed that massage therapy [164-166] attenuates production of inflammatory cytokines  and stress hormones [168-172], reducing endothelial dysfunction  and promoting angiogenesis [174,175]. 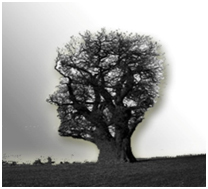 An interesting perspective on the field of mind-body therapies concerns biofield. The National Institutes of Health (NIH) National Center for Complementary and Alternative Medicine (NCCAM) describes biofield therapies as ‘‘intended to affect energy fields that purportedly surround and penetrate the human body” . Biofield therapies seek to work with the human body’s putative vital energy field, which has been described across cultures as chi, qi, ki, and prana, such that changes in the field interact with and lead to changes in physiology as well as mood . This theory has its roots in traditional medical practices such as Ayurveda and Chinese Medicine. While known physiological mechanisms appear to contribute to the beneficial effects of physical touch, a barrier to the acceptance of biofield therapies is the lack of a proven biological mechanism to explain non-contact healing . Electromagnetic energy represents nowadays the bridge between atomic and cellular levels, and currently its therapeutic applications in oncology are under investigation . Given the electrical charge inherent in all the molecules and atoms that make up our body, it is clear that every human being produces a magnetic field. We measure it continually in our clinical practice through electrocardiograms or magnetic resonances. According to some scientists, the electromagnetic energy performs the function of a kind of mold that give shape to the physical body . In the '40s, Harold S. Burr,a Professor of Anatomy at the Yale University School of Medicine, studied the shape of the magnetic fields (which he called "vital fields” or “energy fields") surrounding the plants and animals. He described quite surprising phenomena. According to Burr’s studies, the electric field of a bud or a salamander embryo does not reflect the original seed or embryo shapes, but rather resembles the adult plant or animal . The same would occur in the human body. We know that if you spread iron filings on a piece of paper hanging above a magnet, iron filings spread according to the "lines of force" of the magnetic field of the magnet. If this filing is thrown away and we throw a new, this also take the same form. The molecules and cells that make up the human body seem to behave in a similar manner and their turnover would follow the lines of force of the individual electromagnetic field . It would seem that a vibrational field precedes the appearance of dense matter and is not merely a reflection of the same. Burr provided evidence for this belief both with sophisticated electrical measurements, and also demonstrating the extraordinarily significant hypothesis that the appearance of physical illness (cancer, in his studies) occurs after a measurable change in the organism's electric field . These findings have not been confirmed by other works; however, with the technology available today, it could be possible to design new studies aimed at confirming what was reported by Burr. We have already seen that in quantum physics, the same DNA molecule oscillates and produces a small magnetic field that can be interested by outside influences . Further studies are needed to determine what happens in the case of using biofield therapies ; studies that are likely to affect and be addressed to thinner layers of matter. Interestingly, even in order to see the activity of thought as a force field that can interact with matter, it has been described a correlation between brain electrical activity between two human beings separated in space [182,183,184-186]. Creath et al. demonstrated that sound vibrations (music and noise) as well as biofields (bioelectromagnetic and healing intention [187-190]) both directly affect living biologic systems, using a seed germination bioassay to detect the effects caused by various applied energetic conditions . An interesting hypothesis that could biologically explain these work could address the molecular behavior of water contained in every human cell and plant. It’s known that the magnetized water changes its hexagonal structure leading to significant biologic and therapeutic effects at the level of blood glucose, lymphocyte DNA damage, antioxidant status, and lipid profiles . Water seems to change shape according to electromagnetic influences of an observer/experimenter who manifests its “positive or negative intention” [193-195]. Is possible to measure the personal electromagnetic changing according to various psychological profiles using electroencephalography [111,196,197], electrocardiography [198,199,200], functional brain MRI [201-203] or electrical cutaneous resistance . The studies about the therapeutic effect of magnetized water are limited and experimentally poorly designed . Thus, further scientific analysis is required to confirm these intriguing data. Currently, it has been found some anatomical and physiological correspondences between the energy current systems described in Traditional Chinese and Ayurvedic Medicine (called meridians or srotas) [181,193-196] , that reflect precise locations where the cutaneous electrical impedance varies, as well as endocrine, nervous and immune activity [197,198]. Finally, research is under way to explain the genetic basis of pathophysiological-energetic models theorized in Chinese and Ayurvedic Medicine [205,211,212]. We would like to make a clarification on the last part of this paragraph, related to bioenergetic medicine. We know that some references cited do not belong to newspapers of “high caliber” and have some methodological limitations. However, we think that the cited studies can still represent a starting point for further research and analysis in the light of what is expressed in this manuscript. We want to point out that the description of a phenomenon must be able to stand alone. Neither the fame of a scientist nor the fancy name of a magazine are necessarily synonymous of reliability or plausibility [213-215], but the scientific method by which the data of a study are produced. The theory of relativity is not less scientific if it is announced by Micky Mouse instead of Einstein. Acoustic studies conducted in the anechoic chamber (Orfield Laboratories, please visit https://www.youtube.com/watch?v=u_DesKrHa1U; https://www.youtube.com/watch?v=mXVGIb3bzHI;https://www.youtube.com/watch?v=dtZNjzeShYw) reveal how the sound is crucial to maintain neuronal and brain balance. Through the sound seems to be possible to regain sight [216,217], through the optimization of sound frequencies we can improve neuronal performance ; as explained and shown in the aforementioned videos, the prolonged sitting in an anechoic environment can cause serious psychological and physical imbalances. The sounds are formed by perceptible vibrations. From what has been described using the quantum physics look applied in molecular biology, if our ears were able to hear the full range of frequencies, then we could hear the music of the flowers and plants, mountains and valleys, the song of the sky and stars , as well as the symphony of our bodies: in absolute silence condition a man, in his being made of beats, breathing, yawning, becomes music (Figure 3 and please see https://www.youtube.com/watch?v=WhUKAx6QPP0). Figure 3. An example of Cardiovascular Integrative Medicine Approach. Thefigure depicts heart failure and the therapeutic options. At the left, in A is represented the problem: horses (the heart) have to carry a coach and its load (blood) along a climb (vascular resistances). A way to afford the problem is to whip horses (B) to make them do an harder work. This is the case of an acute decompensated heart, when we can use inotropic agents. Another way to solve the problem is to change the street (C): we can choose a longer way but less steep, so less work for our horses. We can reduce vascular resitances with vasodilator drugs. Another way to face the scenario is to curb horses (D): they will walk on the same climb but slower, thus with less fatigue and preserving energies. Betablockers are the agents we use for this reason. Obviously they are a mainstay for the chronic therapy of heart failure and are contraindicated in the acute setting. Another solution is to reduce the load of the coach (E). This is the role of diuretics and ultrafiltration. Nowadays, we can mechanically assist the heart function, in a partial way, with ventricular assistance devices (VAD) or with total artificial heart (G and H respectively). Moreover, as in the example I we can resynchronize the marching step (i.e., cardiac contraction) through a cardiac resynchronization therapy or CRT. Heart transplantation (F) remains the treatment of choice for many patients with end-stage HF with severely impaired functional capacity despite optimal medical therapy. Next to all these solutions, we can integrate another one: we can take care of the horse before getting sick, keeping it healthy. If the horse becomes ill, we can associate to all pharmacological and surgical remedies a meticulous care of food, herbal medicine, adequate physical activity, a particular attention to emotions and to psychosocial stress, as well as methods of relaxation, meditation and music appreciation. Beyond this consideration, like language, music is a human universal involving perceptually discrete elements organized into hierarchically structured sequences . The scientific literature produced allows to state that music appreciation represents a good stress reduction technique: music comprehension is able to improve quality of life, and shapes the DMN [221,222]. Listening to music improves sports performance, heart rate and heart rate variability , decreases the level of anxiety  in coronary artery disease patients even to a greater extent than orally administered midazolam  and is able to lower cortisol, adrenocorticotropic hormone, prolactin, adrenaline, noradrenaline, atrial natriuretic peptide and tissue plasminogen activator (t-PA) levels . Music efficacy has been also verified in the Emergency Department in order to reduce noise stress . Classical music and meditation music show the greatest benefit on health, whereas other types of sound vibrations (such as heavy metal music or techno) are not only ineffective but possibly dangerous and can lead to stress and/or life-threatening arrhythmias [228,229,230,231]. Interestingly, as revealed by Sleight et al., these effects are independent from individual music taste . The positive effects of classical and meditation music are related to a lower plasmatic levels of all the hormones involved in a stress reaction [226,233-235]. Furthermore,the immune system seems to appreciate and respond to sound vibrations of classical and meditative music,up-regulating anti-inflammatory cytokines and modifying the number and characteristics of circulating B and T cells [120,236]. Finally, we have to consider that the developing field of social epigenetics is now helping us to describe how communication and emotion, prime hallmarks of music, can be linked to a transmissible, biochemical change . The response of a human being to voice and music begins during fetal life, as shown by Al-Qahtani . The benefits of music are accompanied by an improvement in endothelial function [239-241]. Cardiovascular morbidity and mortality are deeply influenced by the physical (for example by cold, hot, humid, sunny or windy climates  or by urban or rural environments ) and social environments. Considering the first factors, it is interesting to note the importance of the quality of the air we breathe. Indoor negatively-charged air conditions affects the human PNEI network  and the mere presence of fine pollution particles is associated with endothelial dysfunction , impacting cardiovascular health and beyond , related to chronic exposure to these elements. Again, these findings show that not exist, in nature, threshold values ​​of safety, and that our body works, compensating, beyond alleged safety limits imposed by the laws relating to precise values ​​of fine dust that "it is permitted" to circulate in the air. Another important consideration is the noise and the constant exposure to urban traffic that increase the incidence of myocardial infarction . On the contrary, it has been shown to reside in a forest rule in a positive and healthy way the PNEI network (for example, reducing inflammation and oxidative stress) [246,247], so much to coin the term of “forest therapy”, with ongoing clinical trials [248-250]. Certainly, we can continue to ignore these factors. We can, for example, continue to pollute the air having faith in medicines to cure us from pollution or that genetic engineering will allow to infect us with artificial genes from whose expression we will become able to breathe polluted air . Or we will rely on the technology that will allow us to create machines able to clean up the air or make us live in futuristic diving suits able to filter it and make it healthy. But will this be “technological advancement”? Or a sad compensation? According to the second factors, myocardial infarction ranges in case of social wild competitiveness and uncertainty [251,252], economic insecurity, social isolation and low social status . In particular, among young post-myocardial infarction patients, higher levels of both cognitive and somatic depressive symptoms, especially regarding economic conditions, are associated with a higher propensity to develop myocardial ischemia with mental stress, but not with physical (exercise or pharmacological) stress . Moreover, it is possible to observe higher mortality from circulatory diseases and ischemic heart disease according to unemployment condition either directly in the unemployed person , both in the family closer (such as the wives of the men seeking work ). Higher rates of myocardial infarction and stroke development have been described in married women with low social support . Furthermore, cumulative exposure to psychological trauma was associated with an increased risk of recurrent cardiovascular events and mortality, independent of psychiatric comorbidities and health behaviors . There’s a strict relation between outbursts of anger, dynamic that easily occurs in modern economic world, and risk of acute myocardial infarction [257,258]. Finally, high perceived stress is associated with greater risks of CVD and death for individuals with low but not high income  and the risk of coronary heart disease increases also among individuals reporting adverse impact of stress on their health (Whitehall II prospective cohort study, over 18 years of follow-up) . Thus, international economic and health strategies should act in order to improve our surrounding environment, making it healthier. Is 993 thousand billion dollars, the value of the global “wealth of paper " at the end of 2013, about 13 times the world gross product. Of those 993,000 billion dollars only 283,000 are primary finance, i.e., stocks, bonds and bank assets; all the rest, 710 000 billion dollars, are derivatives traded outside regulated markets, of which only a small portion is related to transactions that have to do with the real economy. (please visit: http://www.repubblica.it/economia/affari-e finanza/2014/10/27/news/finanza_un_trilione_di_dollari_che_soffoca_leconomia_reale-99097465/). This kind of economy, aimed solely at maximizing profit, undermines people's health, is not sustainable (as the global crisis has shown) and will not help to save the environment in which we live. The problem, as raised by Thomas Aquinas in his Summa Theologiae (please visit: http://www.treccani.it/enciclopedia/tommaso-d-aquino_(Il-Contributo-italiano-alla-storia-del-Pensiero:-Economia), is the “right” profit. In terms of public health this has been the subject of study by Pretty et al. who reported that increases in gross domestic product in western economic systems beyond a threshold of basic needs do not lead to further increases in well-being, demonstrating that material consumption often results in negative health externalities . If environmentally sustainable consumption were increasingly substituted for material consumption, involving non-material consumption became more prevalent (healthy food, active body, healthy mind, community links, contact with nature and low attachment to possessions), then well-being would increase regardless of levels of gross domestic product . It is possible to explain these considerations according to what we have seen so far about epigenetic modifications acting from the endothelial function to all the human being. A last consideration is important in terms of public health: think of food waste. Our planet provides everything all people need: everyday a huge amount of food is thrown in the trash, as reported at the Expo 2015, currently under way. (Please visit: http://www.expo2015.org/it/rapporto-2014-sullo-spreco-alimentare--cosa-e-emerso). The drugs and the actual western health organization aim to manage acute symptoms or to solve problems related to the “exhaustion phase”, as part of the broader reaction to stress described. This approach, however, as clearly pointed out by Marvasati et al. , it is not ideal in a chronic setting, and is economically unsustainable. In this view, Integrative Medicine (Figure 3) has emerged as a new therapeutic model that is patient centered, healing oriented . Such patient care emphasizes the therapeutic relationship and uses therapeutic approaches originating from both conventional and alternative medicine such as meditation [142,162,265], music listening [225,239], alimentation [265,266] or physical exercises [161,267]. All these lifestyle and behavioral aspects, counteracting the stress response, have a positive effect on our health and on our cardiovascular system . Integrated medicine is a humanistic and preventive medicine, that leverages the resources of the sick person, offering diagnostic and therapeutic plans that integrate modern tools of biomedicine with the ancient traditions of the East and West, providing a growing scientific verification . It is a medicine "integrated" and not "alternative", because it is stupid and devoid of any foundation conceives an alternative medicine to the set of practices and knowledge emerged over the past centuries in the biomedicine field. It 's required, instead, an integration of those knowledge that, at the end of quotation, can make a difference (as widely reported in this paper) [270,271]. “It will be possible to maximize the efficiency of health services, reduce the consumption of drugs, and increase the level of prevention and the level of citizens’ participation in the management of their health. The integration must also be a scientific integration, making everything possible to assess the degree of evidence of effectiveness existing in the various medical practices, currently defined as "unconventional". It is to return to have, between the arrows available for the doctor’s bow, some ancient therapeutic tools but scientifically valid. The healthcare provider will recover wisdom and balance, will be a lifestyle teacher, master of prevention and not a simple prescriber. He will know deeply the body language, made of hormones, neuropeptides and cytokines; will master the powerful substances derived from scientific progress in course, but will be able to get the help of herbs, natural substances, his hands, his words, music and meditation techniques. He will be again a guardian and a maintainer of life” . The doctor will know how to do therapy in the etymological sense of the term. The term "therapy" comes from the greek "therapeia" which literally means "to assist someone in his path." In this work we have often used the term endothelial “dysfunction" to conform to the scientific literature produced up to now. In fact, considering the PNEI network, epigenetics and the concept of allostatic load, we should simply use the term endothelial “regulation". Indeed, it is as if we were observing an engine that can work, for example, from 1000 rpm to 10,000 rpm. If we look it at 2000 rpm or 8000 rpm, it is not "dis-functioning", but it’s simply working at those levels. And this, as we have seen, concerns a rich network of relationships, which can be modulated to "regulate" the functioning of the biological processes observed. Given the influence of stress on endothelial function and the ease of instrumental measurement of this parameter, it will be possible to use it as a simple tool to determine if these or further alternative techniques have a real therapeutic effect . Verify the effect of a medium such as meditation, mind-body therapies or music is particularly hard. Numerous subjective bias are lurking and difficult to measure or inevitable. Moreover, different meta-analyses of high-quality studies can arrive at different conclusions based on authors’ selection of studies . Randomized clinical trials (RCTs) can only be done, by definition, with patients and individuals who are willing to be randomized. Thereby such trials are excluding the potentially most beneficial therapeutic agent: conscious choice and active engagement. Thus, by default, RCTs can only test and describe what is the minimum effect on people who use a certain intervention, as if it were delivered to them as a passive recipient, like a medication. However, music listening or playing is no medication. It requires active involvement and the decision to dedicate regularly a specific amount of time, over a larger period in order to change one's habits, attitudes and physiologic responses. This can only be assessed in long-term comparative cohort studies that in other conditions and occasions have shown reliable results comparable to RCTs . In order to explore correctly many faces of the so called “alternative medicines”, the scientific inputs should conform to the basic ancient principles and philosophies of the considered remedies, investigating them “as they are”: such research will require the already discussed “whole system biology and physics approaches”, global participation with protocols evolved through intense interface with modern science, and regulatory reforms to eliminate cultural and economic barriers . In Table 1 are reported many evidences about the therapeutic effect of the Integrative Medicine approach in different diseases. In Table 2 are presented some epigenetic mechanisms that can control chronic inflammation linked to endothelial dysfunction. These factors are related to the disciplines involved in Integrative Medicine paradigm. Table 1. The Integrative Medicine approach. modulate IL4 production, Th1/Th2 balance and IgE production. systems; ↑levels of breast-milk melatonin in both mothers with atopic eczema and healthy mothers. Table 2. Epigenetic mechanisms that regulate chronic inflammation linked to endothelial dysfunction. We are living in a delicate moment for medicine and science in general: unsustainable costs, poor outcomes, frequent medical errors, poor patient satisfaction and worsening health disparities, all point to the need for transformation [275,276]. For more than ten years now, it is known that most of the population (2/3 of adults), also in Western countries, resort to “natural, complementary and alternative remedies” to keep their health . In 2005, the United States spent an estimated 5.6% of its total health expenditures on biomedical research, more than any other country, but less than 0.1% on research in health services. From an economic perspective, biotechnology and medical device companies were most productive, as measured by new diagnostic and therapeutic devices per dollar of research and development cost. Productivity declined for new pharmaceutical drugs . Furthermore a lot of drug therapy studies are built with the bias of important economic interests leading to a “selling sickness” behavior in the public and private health systems [279,280]. A recent study by Hutchins et al . revealed that one in three Americans said they would prefer to risk living less long than to take a pill daily to prevent CVD. In addition, about 21% of the participants to this study, also would pay $ 1,000 or even more if this would allow to avoid the pill daily. These data show that, even ignoring entirely the aspect relating to the side effects, the simple act of having to take a pill every day can have a strong impact on the quality of life of a person and his perceived stress. Considering the fact that many adults take multiple medications every day, the effect is likely staff multiplied; at the population level, even a small reduction in quality of life such as the one highlighted in this way, multiplied by millions of people, it can have a very important effect on the cost / benefit ratio of a drug. Is it really possible to heal a tree without curing the grass and the forest that surround it? Fruit depends on the branch, the branch on the trunk and the trunk on the roots and the soil in which they are planted . What we are comes from our roots and from what we are rooted in. Choose the roots and you will decide the fruits. What is the answer for patients asking us if it is possible in their future to discontinue beta-blocker therapy after an acute coronary syndrome or the onset of arrhythmia? They are asking about what kind of change is necessary to restore health, not just a way to get back into balance! Sometimes, during the days I work in hospital, I am under the impression that the therapies that have been scientifically demonstrated as a valid method are somehow and sometimes like taking a yellowed apple and painting its peel red. We have to continue the therapy because we are focused on its color and on the mechanisms that regulate it, without considering the roots, the soil and the surrounding area in which the tree is planted. By changing these elements, the color of the apple will change by itself. Let us think about what we described so far and the results of psychological and behavioral therapies, the effects of music and meditation and all the “alternative therapies“ that are emerging nowadays (the scientific evidence of their results is shown in Table 1 and 2) and that our patients often ask us about. What are we supposed to tell them? Standard of care drugs may not always protect our patients during their lives ! As well, some established diagnostic practices are not effective to properly stratify the risk of a patient , or lead to overdiagnosis and overtreatments . Integrative medicine has emerged as a potential solution to the crisis in the healthcare of the US and western countries. It provides care that is patient-centered, healing-oriented, emphasizes therapeutic relationship and uses therapeutic approaches originating from conventional and alternative medicine. Initially driven by consumer demand, the attention that integrative medicine places on understanding persons as a whole and assisting with lifestyle change is now being recognized as a strategy to address the epidemic of chronic diseases bankrupting our economy. For integrative medicine to flourish in our countries, new providers, new provider models, a realignment of incentives and a commitment to health promotion and disease management will be required . The contemporary doctor must take into account the physical, psychological and social environment of each patient. It is not so sure that life expectancy will continue to grow, if we continue to ignore these factors. The World Health Organization has declared, since 1946, that "health is a state of complete physical, mental and social welfare and not merely the absence of disease or infirmity", asking the governments to work responsibly, through a program of health education suitable for achieving that aim. Such concept was subsequently repeated and integrated in the Ottawa Charter of 1986 during the first International Conference on Health Promotion. This work aims to be an opportunity to invite anyone interested in building an international task-force involving cardiologists, neurologists, immunologists, endocrinologists, psychologists and psychiatrists, sociologists, geneticists, biologists, physicists and bio-engineers to organize research on those factors that are effective in modulating the psycho-neuro-endocrine-immune network that constitutes a human being. As sir William Osler said : “the good physician treats the disease; the great physician treats the patient who has the disease. Medicine is the science of uncertainty and the art of probability. One of the first duties of the physician is to educate the masses not to take medicine. It is much more important to know what sort of a patient has a disease than what sort of a disease a patient has. The value of experience is not in seeing much, but in observing wisely. He who studies medicine without books sails an uncharted sea, but he who studies medicine without patients does not go to sea at all. Observe, record, tabulate and communicate. Use the five senses. Learn to see, learn to feel, learn to smell, and know that only through practice you become expert. Acquire the art of detachment, the virtue of the method, the accuracy and quality, but above all the grace of humility. In truth, there are not specializations in medicine, since to fully know many of the most important diseases you must be familiar with their manifestations in many organs. The desire to take medicine is perhaps what most distinguishes human beings from animals. Patients need rest, food, fresh air and exercise - the so called “quadrangle of health”. The young doctor starts with 20 medications for each disease, the old one ends up with a single medicine for 20 diseases. The more one is ignorant, the more it is dogmatic”. Fioranelli M (2014) Journal of Integrative Cardiology. J Integr Cardiol 1: 1. Dal Lin C, Tona F, Osto E (2015) Coronary Microvascular Function and Beyond: The Crosstalk between Hormones, Cytokines, and Neurotransmitters. Int J Endocrinol. Dias P, Joshi M. (2012) Endothelial dysfunction as a risk factor for cardiovascular disease; its modulation by phyto-ingredients and implication in better cardiovascular health. Oxid Antioxid Med Sci 1: 1. FabioFirenzuoli. Fitoterapia. Guida all’uso clinico delle piante medicinali. 4th ed. Milano: Elsevier, 2009: 231-268. Camm AJ, Luscher TF, Serruys PW (2009) ESC Textbook of Cardiovascular Medicine Second Edition. Oxford Med: 1-1398. Nieman DC (2008) Regular moderate exercise boosts immunity. Agro Food Ind Hi Tech 19: 8–10. Nieman DC (2011) Moderate Exercise Improves Immunity and Decreases Illness Rates. Am J Lifestyle Med 5: 338–345. Garber CE, Blissmer B, Deschenes MR, Franklin BA, Lamonte MJ, et al. (2011) Quantity and quality of exercise for developing and maintaining cardiorespiratory, musculoskeletal, and neuromotor fitness in apparently healthy adults: Guidance for prescribing exercise. Med Sci Sports Exerc 43: 1334–1359. Bottaccioli F. Il sistema immunitario: la bilancia della vita. 2nd ed. Milano: Tec. Nuove, 2008: 1-428. Luciano S. Psicofisiologia (2009) Dalla genetica comportamentale alle attività cognitive. Zanichelli: 1-224. Brook RD, Appel LJ, Rubenfire M, Ogedegbe G, Bisognano JD, et al. (2013) Beyond medications and diet: alternative approaches to lowering blood pressure: a scientific statement from the american heart association. Hypertension 61: 1360–1383. Bhasin MK, Dusek JA, Chang BH, Joseph MG, Denninger JW, et al. (2013) Relaxation Response Induces Temporal Transcriptome Changes in Energy Metabolism, Insulin Secretion and Inflammatory Pathways. PLoS One 8. Kay A (2007) Yoga and Meditation: An Adjunct to Nutrition Counseling in Weight Management: Program Rationale and Design. J Am Diet Assoc 107:A98. Bhavanani AB, Udupa K, Madanmohan, Ravindra P (2011) A comparative study of slow and fast suryanamaskar on physiological function. Int J Yoga 4: 71-76. Gallagher B. Tai Chi Chuan, Qigong (2003) Top Geriatr Rehabil 19: 172–82. Matthews RE (2007) Harold Burr's biofields measuring the electromagnetics of life. Subtle Energies & Energy Medicine Journal Archives 18: 55-61. Montagnier L, Aissa J, Del Giudice E, Lavallee C, Tedeschi A, et al. (2010) DNA waves and water. J Phys Conf Ser 306: 1–10. Thaheld F (2004) Comments on the paper ‘Correlations between brain electrical activities of two spatially separated human subjects’, by J. Wackermann, C. Seiter, H. Keibel, H. Walach, Neurosci. Lett., 336 (2003) 60-64. Neurosci Lett 360: 178–179. Radin D, Lund N, Emoto M, Kizu T, Sciences N, et al. (2008) Effects of Distant Intention on Water Crystal Formation? A Triple-Blind Replication. J Sci Explor 22: 481–493. Omura Y (1989) Connections found between each meridian (heart, stomach, triple burner, etc.) & organ representation area of corresponding internal organs in each side of the cerebral cortex; release of common neurotransmitters and hormones unique to each meridian and co. Acupunct Electrother Res 14: 155–186. Short AE, Ahern N, Holdgate A, Morris J, Sidhu B (2010) Using Music to Reduce Noise Stress for Patients in the Emergency Department: A Pilot Study. Music Med 2: 201–207. FrancesAJ. Antidepressant Use Has Gone Crazy: Bad News From the CDC | Psychiatric Times. Psychiatr Times October 28, 2011. AngellM. The Truth About the Drug Companies. The New York Review of Books. July 15, 2004. Spoladore P (205) Vita da vita. Riflessioni sul vangelo. Usiogope srl: 99. Short AE, Short KT, Holdgate A, Ahern N, Morris J (2011) Noise levels in an Australian emergency department. Australas Emerg Nurs J 14: 26–31. Trappe H-J (2012) The Effect of Music on Human Physiology and Pathophysiology. Music Med 4: 100–5. Berkman L. Social intergration, social networks, social support and health. In: Glass T. Social Epidemiology. New York: Oxford University Press; 2000: 137–173. Peet M, Horrobin DF (2001) A dose-ranging study of ethyl-eicosapentonoate in treatment-unresponsive depression. J Psychopharmacol 15: 12. Perez-De-Albeniz A, Holmes J (2000) Meditation: Concepts, effects and uses in therapy. Int J Psychother 5: 49–58. Youngwanichsetha S, Phumdoung S, Ingkathawornwong T (2013) The effects of tai chi qigong exercise on plasma glucose levels and health status of postpartum Thai women with type 2 diabetes. Focus Altern Complement Ther 18: 182–7. Kasper D, Fauci A, Hauser S, Longo D, Jameson JL, et al. (2015) J.Harrison's Principles of Internal Medicine 19 Ed. McGraw Hill: 1-3000. FOCUS marzo 2015. Focus Gruner Jahr/Arnoldo Mondadori Ed 2015; 6:31.